`96 - billet grill with minimal bars? Discussion in 'Modified Explorations!!' started by Blind, December 16, 2004. Just went through 25 pages of threads here about billet grills, and couldn't find one that I wanted. basically I see 3 types, the EE that bolts on but is an overlay, the ebay kind that zip-ties on, and the ebay kind that requires cutting of existing grill and bolting in. I like the 3rd option, and have a few on my watch list on ebay that come out to around $50 shipped. but all of them have a ton of bars...are there any made that have a very low amount of thicker bars? I also can't find that bumper insert anywhere but @ the mrgrille.com website and they want way too much money for it, I refuse to pay twice as much for the bumper grill as the headlight panel grill, lol! Check out carraige works grilles, you have to do a lot of chopping but oh well. I have yet to install mine, it's been too cold to mess with. I got a black one off of truckperformance, it was on sale for like 97 bucks shipped. I haven't come across anyone that makes a bumper billet that I've liked, so I'm just going to put lights in there instead. After TONS of research, I settled for the 10-bar eBay "cutout" grille, where you have to mod your factory grille. I bought it thinking that i could mod the billet grille and make it an overlay ( i don't like the 25 bar look - IMO - looks like a sheet of metal over your grille), but it's way too thick to mod-to-fit. I have yet to install it. It's identical to all the others selling for $30 + 20-25 s&H. I cannot vouch for it's quality or whether it holds up like the $100-$200 billets from high-end online stores, but i figure it'll last me longer than i have the X.
I bought one of the other grilles (25-bar) from another member here that must have used a bandsaw to cut it to fit the bumper. Again, haven't installed it but i've temporarily put it in and it looks good. You don't really notice the difference in bar-count when looking at the two of them. I bought a 10-bar Ebay one for $40 last January and I bolted it on without cutting the stock grill. Im sure it could look better if I had cut it since it sticks out slightly but its nothing easily noticed. Anyone have this grille? It's stainless and I believe it only fits 98+ explorers. Lee, I don't think that grill will fit our 2nd gens, it says 02-C, which I take to mean as current. There are oodles of options for guys with 02+ X's, but we kinda got the short end of the stick in the mod department. I know the pic is an 02 and that's the way it's listed on their web site. I did call them and they said they have grille for a 98+. LOL, Oh well than that explains it! I wonder why they don't advertise the 98+ one as well? I think I'll be getting one of those 10 bar grills! 95Xsport how does it bolt in...any brackets or what? 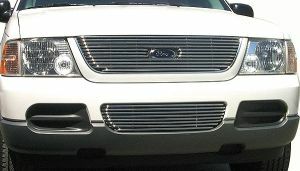 Is it possible to put one of those grills onto a 1998 mercury mountaineer? Seems like there would be alot more cutting involved with a merc. Are there any grilles that sit BEHIND the stock grille? (behind the blue oval, replacing the black plastic mesh). I like the grille look... but not as prominent as these shown here.